Mac OS X 10.7 Lion, the latest iteration of Apple’s operating system, debuted this morning, just as CFO Peter Oppenheimer said it would during the company’s third-quarter earnings call Tuesday. 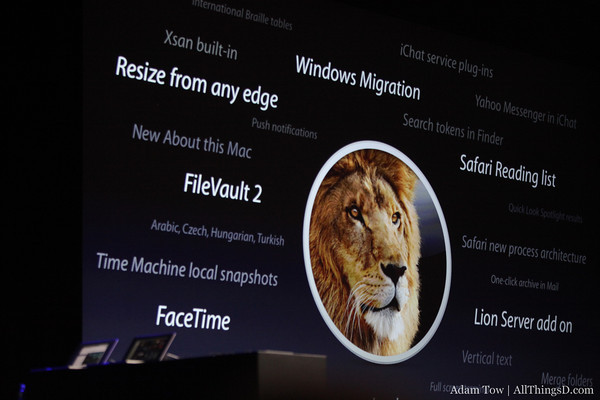 Unlike previous OS upgrades, Lion is available exclusively as a $29.99 download from the Mac App Store. It brings some 250 new features to OS X, among them a number culled from iOS, and is intended to bring the best of Apple’s mobile OS to the desktop. Also included: A completely new version of Mail, AirDrop — a peer-to-peer Wi-Fi-based network for document sharing — and Resume, a feature which works systemwide to remember what app you were using and what you were doing with it. You’ll find more details and a thorough review from Walt here and the full press release below. CUPERTINO, California—July 20, 2011—Apple® today announced that Mac OS® X Lion, the eighth major release of the world’s most advanced operating system with more than 250 new features, is available today as a download from the Mac® App Store™ for $29.99. Some of the amazing features in Lion include: new Multi-Touch® gestures; system-wide support for full screen apps; Mission Control, an innovative view of everything running on your Mac; the Mac App Store, the best place to find and explore great software, built right into the OS; Launchpad, a new home for all your apps; and a completely redesigned Mail app.